Aiming to improve work efficiency in such areas as tillage in agriculture, earth-moving in civil engineering, and tunnel-making in sea-bed operations, this work offers an introduction to Finite Element Method (FEM) analysis of soil-machine systems. It explains the advantage of FEM's numerical approach over traditional analytical and empirical methods of dealing with complex factors from nonlinear mechanical behaviour to geometric configurations. "…well written and the material has been logically mounted and presented. The authors have performed a very valuable service…by providing the material in this book in a fashion that permits one to grasp the essential elements of the complex procedures required in the application of the FEM of analysis of the stability of interfacing bodies. The book can be well recommended. 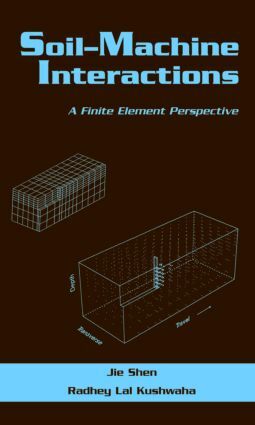 … It provides a very basic development of the method of application of finite element analysis as a tool for the study of interfacing elements." Basic procedures in a finite element analysis; constitutive models for agricultural soils; simulation of soil-metal interfaces; algorithms in static, dynamic, linear and non-linear finite element analyses; examples of soil-tool; programming techniques for finite element analyses.